Dr. Von Hoff has devoted his career to translational medicine – the movement of new therapies from the research institution to patient care – and has personally been a part of over 200 clinical trials. Dr. Von Hoff and his colleagues have conducted early clinical investigations of many new cancer agents, including: gemcitabine, docetaxel, paclitaxel, topotecan, irinotecan, fludarabine, mitoxantrone, dexrazoxane, nab-paclitaxel, vismodegib and others. NFCR’s support for Dr. Von Hoff’s research with gemcitabine was profoundly successful as it became the first drug to improve survival for pancreatic patients. Many treatments he worked on are now helping tens of thousands of patients with breast, ovarian, prostate, colon, leukemia, skin (advanced basal cell carcinoma) and pancreatic cancer today. At the NFCR Center for Targeted Cancer Therapies, Co-Directors Dr. Von Hoff and Dr. Laurence Hurley are currently pioneering new approaches to attack the so-called “undruggable” targets present in many tumors. They have identified multiple new compounds that selectively kill pancreatic cancer cells with mutations in the cancer-causing K-ras gene—which are present in more than 90% of pancreatic tumors. The leading compounds are being further developed for possible clinical translation. Dr. Von Hoff is also working on an entirely new approach to treating cancer by developing drugs that block newly-recognized genetic structures called “super enhancers.” These large clusters of DNA regulatory elements control the expression of a host of genes — including the critical cancer gene c-Myc – and offer a great opportunity for cancer disruption. This new approach may lead to great improved treatments for pancreatic cancer, lung cancer (small-cell type, in particular), lymphoma, multiple myeloma, colorectal and other cancers. Daniel Von Hoff, M.D., attended Carroll College and Columbia University before conducting his residency in internal medicine at UC San Francisco. After that, he had a fellowship in oncology at the National Cancer Institute before joining the faculty at the University of Texas Health Science Center as a professor of medicine and cellular and structural biology. Dr. Von Hoff went on to become the founding director of the Institute for Drug Development at the Cancer Therapy and Research Center and director of the cancer center at the University of Arizona. Dr. Von Hoff’s major interest is in the development of new anticancer agents, both in the clinic and in the laboratory. Throughout his career, Dr. Von Hoff has published more than 650 papers, 140 book chapters and 1,000 abstracts. Dr. Von Hoff was selected as a 2016 Giant of Cancer Care® by OncLive, honored with the Scripps Genomic Medicine Award in 2011, named one of the American Society of Clinical Oncology 50 Oncology Luminaries in 2014 and among the first class selected in 2013 by the American Association for Cancer Research (AACR) for its Fellows of the AACR Academy. 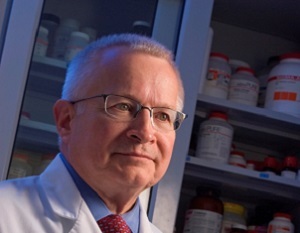 In addition to leading the NFCR Center for Targeted Cancer Therapies, Dr. Von Hoff was appointed to President Bush’s National Cancer Advisory Board from 2004-2010, is the past President of AACR, a Fellow of the American College of Physicians and a member and past board member of the American Society of Clinical Oncology. He is also the founder and the Editor Emeritus of Investigational New Drugs – The Journal of New Anticancer Agents and past Editor-in-Chief of Molecular Cancer Therapeutics. Your ticket for the: Daniel Von Hoff, M.D.